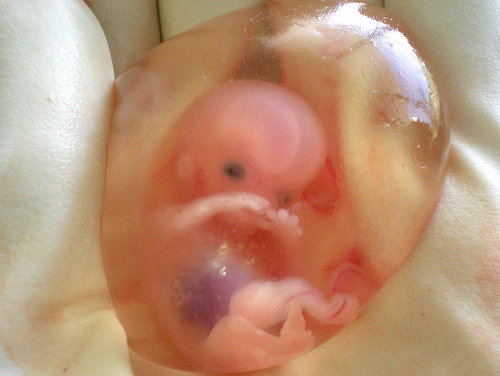 Diary of a Pro-life Girl: Abortion to Save the Mother? So I guess the first thing we have to do here is properly define abortion. Is it simply defined as the ending of a pregnancy, regardless of the circumstances? This definition would include miscarriages, and procedures such as this one which inadvertently cause the baby's death. So obviously, if this is how abortion is defined, there are some instances where abortion is a morally acceptable or, at the very least, a morally neutral act. If, however, you define abortion as an act which is performed with the singular purpose of intentionally causing the death of the baby, then our opposition to abortion is hopefully easier to understand. In this case, the procedure that the mother went through would only be considered a hysterectomy, not an abortion. This is because the intention was not to kill the baby, and the action did not directly cause the baby's death. The baby died because the entire womb was surgically removed, not because a doctor dismembered the baby or burned the baby with a saline solution. 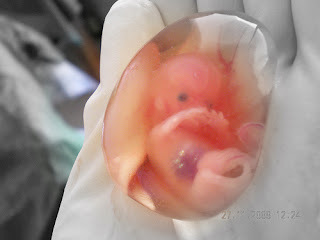 If this was an abortion as pro-life Catholics define it (since I am a Catholic, that is who I can speak for), then the pictures of this baby would not look beautiful at all. So, to address the first comment. If you define abortion as the intentional killing of a baby, yes it is a black and white issue because it is always wrong to intentionally kill someone. That is not what happened here. The baby died as a side-affect of the mother's treatment, NOT because it was aborted. And anyway, a hysterectomy is not included as an abortion procedure on any abortion websites I've read. To address the second comment, Pope Benedict would not condemn this woman, her doctor, or anyone involved in the procedure, to hell, because they did not intentionally kill a baby. They treated the mother's illness. And sadly and very regrettably, the baby died as a result. As long as the intention is not to kill the baby, this is allowed in Catholic teaching. We are against elective abortion. We are against abortions which tear apart the baby's body, or burn it until it dies ... we are not against performing standard, life-saving medical procedures, when the procedure is one that would be used in the case of both a pregnant or non-pregnant woman and when the procedure does not intentionally cause the death of the baby. We are for doing everything possible to save the mother AND the baby, but we recognize that sometimes, it isn't always possible to save both. I'd like to end this post with another quote from the comments. I don't agree with everything restiform body said, but it is important to remember that while the photos of this baby are beautiful, the baby is dying, and we should acknowledge that. Hi Everyone. I noticed that this is a really popular post, so I thought I'd make a small addition. I talk above about how this photo would not look beautiful if it had been a typical elective abortion procedure. To contrast the above photo, I thought I would show you all some pictures of babies who have been aborted, according to the definition I use above. Here is a video called Created Equal. I warn you, it is VERY graphic (and I have not checked if the images and videos have been verified by a doctor - but they seem consistent with images I have seen which have been medically verified - but of course I am not in the medical field so I cannot say with any certainty whether this is actually the case or not). So watch it if you feel you can (and take it with a tiny grain of salt). I burst into tears halfway through and probably won't ever see it again if I can help it. My heart breaks looking at those photos. I wouldn't wish that on any mother...my heart goes out to her and her family! @littlebytesnews ... I'm new to twitter so I'm not sure if I sent you a message properly, but you're welcome to repost this :) Just send me a link. Faith ... its definitely terribly sad :( I really hope her and her family are doing ok now! !